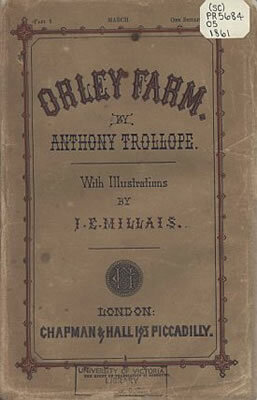 Orley Farm is a serial novel by Anthony Trollope published originally between 1861 and 1862. A drama steeped in themes of judgement -- of oneself and of others -- Orley Farm also explores the changing Victorian world through changes in agricultural techniques and their impact. The plot centres around Lady Mason, widowed second wife of Joseph Mason. While his Yorkshire estate was left to his family, a codicil to his will left Orley Farm (near London) to his much younger second wife and infant son. As the will and the codicil were in her handwriting, both were bitterly contested and accusations of forgery were made. While the codicil was at first confirmed as valid, the issue is raised again twenty years later when her son, now an adult, evicts a tennant from the farm.